We have been doing Baby Led Weaning with Stella, which means when when we started Stella on solid foods at six months, we let Stella feed herself (“weaning” in this sense means “adding complementary foods” – the British definition). I thought it was such a great concept of letting babies learn how to chew before they learned how to swallow, and it has gone really well for us. There is an actual book that outlines this method, but everyone I know who has read it said to skip the book and buy their cookbook, because the first 40 pages of the cookbook are a synopsis of the book, so that’s what I did. Here’s a link to the book. I wrote an entire post about it here if you want to learn a bit more about it. We pretty much give her whatever is on our plates, as long as it doesn’t have a lot of added sugar/salt! How did daycare do with the BLW? I want to start with Miss Ava in the next month and want to be prepared when it comes to resistants at daycare. Personally, I think it will be easier on them but it is ‘different’. We use a home daycare, and she thought I was a bit crazy at first, but I made a point of sending food that was ALREADY cut into the sizes I wanted her to have (the finger length, 1/2″ width, etc) and emphasizing that I did NOT want her to cut it smaller because it would actually be more dangerous for Stella if she did that because she is used to gumming things. 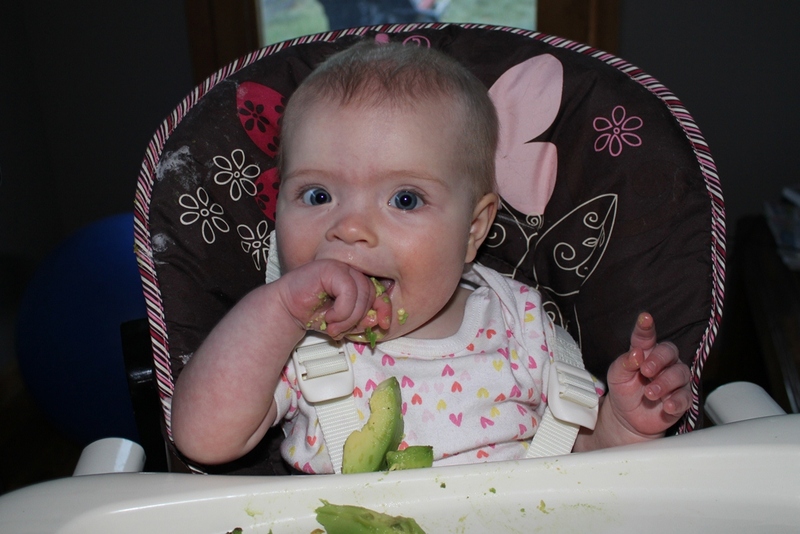 She shortly became STOKED at how much easier it was to feed Stella than all of the other kids – said it makes “way more sense to teach them to chew first.” Now she tells all of the other parents about it! I think the biggest thing was sending food that is already cut/prepared into the shape/consistency you want and asking them not to alter that. Once they get used to it, then I didn’t care if they gave her different snacks etc. because they better understood the guidelines I wanted followed. Thank you so much! I have really appreciated your blog. It has helped me figure out what kind of mother I am. I can embrace my little earthy-crunchy side but still be mainstream (I am an auditor, I like rules! lol). Whether you knowit or not, you have provided me with lots of advice and insight has really made me a better mom. Thank you! PS- Oh Grandmas! Sometimes around just to drive Mommies bonkers!